Physical Description Young and sharp. She carries herself with a confidence but otherwise rather blends in. Her black irises give her away as a telepath if anyone is paying attention. Ozzie has tattoos, but none of them are visible in uniform. Her upper arms and thighs are covered around in a delicate and complicated interweave of vine-like lines. If you look really closely, similar lines can be seen through the hair on the nape of her neck, as her scalp is also finely tattooed. They are all marks of the Order of Altha (one of the Four Deities of Betazed) from her teenage years as an acolyte, although she never made it far enough in the order for the rest of the markings akin to the ones her mother is entirely covered with. General Overview Optimism is a guiding principle for Ozzie. She clings to hope pretty readily and she can focus on silver linings without a lot of prompting. Even when staring into some pretty frightful situations on the job, she doggedly believes that finding justice and restoring things to rights will make a difference. You can knock her down but she bounces back every time. Ozzie is reasonably outgoing, enjoying the company of others and finding ways to turn as many acquaintances as she can into friendships. She invests a lot of herself in others. At the same time, she can enjoy her personal time quite a bit and isn’t desperate to impress others. Impulses are sometimes difficult for her to resist and she can sometimes react or respond before thinking. Strengths & Weaknesses She has average telepathic abilities and uses them on the job when it’s ethical or under duress when lives are at stake. She doesn’t always report just how she came across such information or where she got the idea to look into certain things. Hobbies & Interests Ozzie loves reading mystery and crime novels. She has a morning and evening ritual series of poses based on some traditional practices in her mother’s holy order to train her focus, awareness, balance, and breathing. To keep her skills sharp, she practices boxing and firearms whenever she can. Personal History In 2369, on Betazed, Ozzie was born to Melel Isuri, a High Priestess of the Order of Altha. Her mother was not wed to her father. Ozzie grew up around the temples but had long vacations in the city where her father lived. Ernandan "Ernie" Thorp was a peacekeeping officer. He’d been in service to Betazed all his adult life, even fighting in the psionic effort against the Dominion invasion while Ozzie was just a few years old. Ernie had a daughter and a son ten and fifteen years older than Ozzie, from a first marriage. And he remarried when Ozzie was about 12 and there were three more kids from that marriage. Melel had children in other relationships throughout her life as well, five other half siblings, none of them children of either of her own marriages. Ozzie was close with a few of her brothers and sisters. Her homelife was always a little bizarre, but the Temple of Altha was a stable, predictable place. She dedicated herself when she was 12, becoming an Acolyte and studying the Sacred Books of Kapara. When she visited with her father, she felt like she was in a different world. The Temple was grand and enormous, ancient and venerated. But her father’s home was a place in the suburbs full of junk with loud family members constantly cycling through. Her father introduced her to crime fiction in various forms and took her with him to the station and on his regular patrols when she was older. It was about the same time that she was having trouble in her Acolyte training when she was identifying with the points made in a disfavored sect that questioned some of the traditional interpretations of the Kaparan text and her mother had gently discouraged her from speaking of those things. Ozanna questioned continuing at the temple and took a shine to the police work her father was doing. It seemed like asking questions and following leads got the job done there and she started to ask for more time with her father, becoming accepted around the station and eventually landing a job there as an intern when she was 16. Melel wasn’t disappointed, but strangely congratulatory, telling Ozanna to follow her path and seek truth. 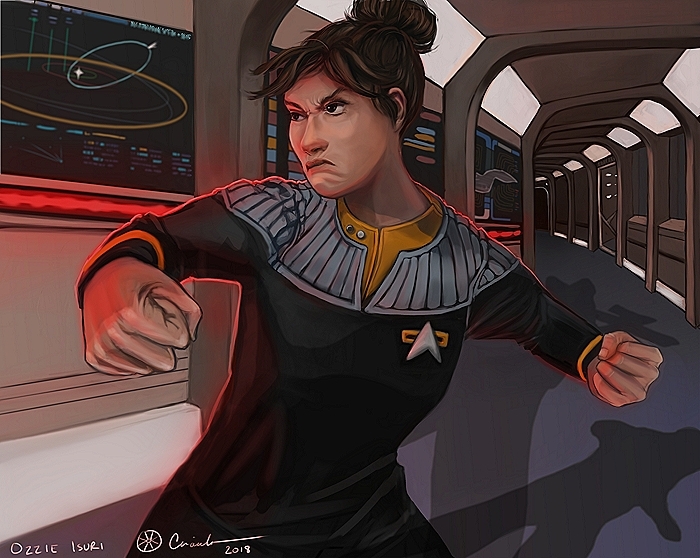 At 18 she applied to the Security track in Starfleet, ambitiously looking forward to some time away from Betazed and expecting that maybe later in life she would return to local police work. She did very well in Academy. After graduating at age 22, the newly minted Ensign was assigned to Star Fleet’s base of operations on Terra Nova, an Earth protectorate colony. On Terra Nova she assisted with Starfleet investigations in the region. She was a little discouraged by how difficult some were to solve and how many didn’t have strong enough evidence to act on, but she was always first at the board in the morning and ready with new ideas, quick to offer to sniff out any leads. After a couple of years in investigations on Terra nova, she put in for a ship posting, looking to try something different.